Rare forbidden fruit from Athlone will be in the national spotlight at Timeless, The Irish Antique Dealers Fair, in Dublin’s RDS, from September 28-30. The legends and lore of the celebrated coco de mer nut, said to be the fruit which tempted Eve in the Garden of Eden, will be celebrated by an Athlone-based antique dealership. Louis and Vernon Walsh of Treasures Irish Art and Antiques, Athlone will be displaying a 30×30 cms coco de mer nut bound in Birmingham silver from 1899 at Timeless, The Irish Antique Dealers Fair, at Dublin’s RDS, from September 28 to 30. The coco de mer nut was reputed to be the forbidden fruit of the Garden of Eden and to have extraordinary healing properties. 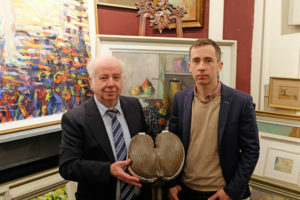 Louis and Vernon Walsh of Treasures Irish Art and Antiques, Church Street, will be displaying a 30×30 cms coco de mer nut bound in Birmingham silver from 1899 priced at €3,500. “We are delighted to bring this rare and very interesting item to Timeless,” said Louis. “The nut of the coco de mer is the largest seed in the plant kingdom and is oddly shaped, being the shape and size of a lady’s bottom on one side, and belly and thighs on the other. “Not surprisingly, in times past, it was viewed as a rare and fascinating object with mythological and even magical properties, including healing powers. “The name coco de mer means coconut of the sea and it is from a rare species of palm tree native to the Seychelles. Visitors to Timeless will also be able to view the treasures of Salvador Dali for the first time in Ireland. Gormleys Fine Art are bringing a collection of 14 Dali works, worth over €300,000, to the event, the first time that a display of this size has come to Ireland. “This will be the first chance for many people to experience so much of Dali’s work at close hand,” said Oliver Gormley. The top Irish jewellers will also be in attendance at the Fair which features a carefully selected blend of contemporary and antique-focused exhibitors, allowing all ages to focus on the once-off, yet affordable, design that appeals to them. Admission to Timeless, The Irish Antique Dealers Fair, at the RDS from September 28-30 is €10, available at the door. For more information see timelessantiquesfair.ie.